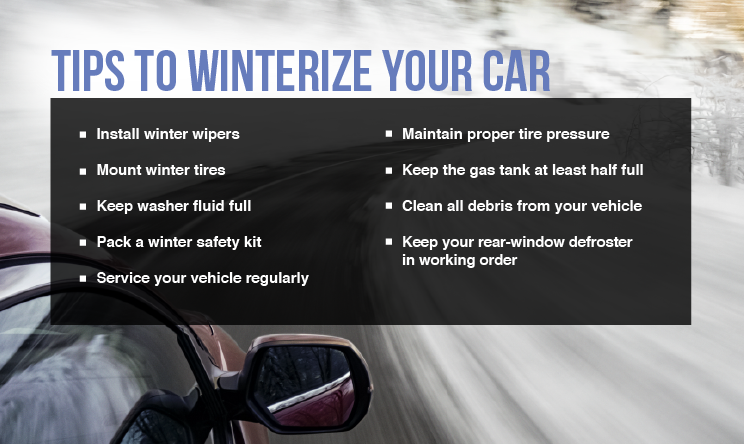 It is recommended that you start to winterize your vehicle before the cold weather hits, to ensure that it can handle not only winter road conditions, but winter weather elements such as snow, ice, slush and freezing rain. Get a tune-up, to include an oil change and battery check. Make sure you use the right motor oil. Engine oil thickens when cold, making it harder for the engine to turn over. Newer vehicles use multi-weight oil that is suitable for a wide range of temperatures. Check your owner’s manual to ensure your engine has the right grade of oil for the right time of year. Check your windshield wipers. If your wipers are leaving streaks of water on the windshield, or if the wiper-blade rubber shows signs of cracking or stiffness, replace them with a new set. Use a brush and scraper to remove ice and snow, rather than your wipers. A heavy load of snow (or ice sticking the blades to the glass) can overload the motor. Keep the battery in good shape. Cold temperatures reduce the battery’s cranking power. At about zero degrees Fahrenheit, your battery only has about half the cranking power it has at 80 degrees. Have the battery power and its fluid levels checked. Let the engine warm up. During cold, winter weather newer-model cars can easily be put in gear and driven as soon as they’re started, but that doesn’t necessarily mean skipping the warm-up entirely. Pay attention to weather reports on the television or radio. Allow time in your schedule for bad weather and/or traffic delays. Visit Ohio Department of Transportation’s www.OhGo.com for current traffic information such as weather-related road conditions, road closures and traffic accidents. Keep your windows clear of snow and ice. Remember to brush off the head, tail and brake lights, too. If you turn on your windshield wipers, turn on your headlights. It’s Ohio law. Failing to do so is a secondary offense. Click here to read ORC 4513.03. Keep your gas tank at least half full to prevent fuel line freeze-up. Fill your gas tank completely full before parking your car for lengthy periods. Leave ample stopping time between you and the driver in front of you. Braking distance can be up to nine times greater on snowy, icy surfaces than on dry roads. Gently pump Non-ABS brakes to stop the vehicle. Take any corrective action gradually. You will need to maintain full control of the vehicle. Refer to the vehicle operations manual for proper methods to correct skids. During winter travel, it is best to supply those at your destination with the following information: Your cell phone number, departure time, travel route, and anticipated time of arrival. Lock your vehicle, even in bad weather. To prevent door and trunk locks from freezing, lubricate the locks with a silicone spray or door-lock lubricant. If they’re already frozen, use a lock antifreeze product to thaw them. Do not pour hot water on the locks – they will refreeze. Drive with extreme caution on bridges and overpasses during freezing temperatures. Because bridge temperatures can be 5-6 degrees colder than roadways, they can become slick and icy before roads. Tie a bright colored cloth (handkerchief, towel, etc.) to the vehicle’s driver door handle or outside mirror. Keep the exhaust pipe clear of snow. Poisonous gases can filter into the vehicle if the pipe is clogged. Run the engine and heater no more than 10 minutes every hour, leaving a downwind window slightly open for ventilation while the engine is running. Light a flare or turn on a flashlight to let others know you’re stranded in the vehicle. Use blankets or seat covers for added warmth. If you must leave your vehicle during a severe snow storm or blizzard, secure a line of rope or cord to yourself and the vehicle to avoid becoming lost or disoriented. Keep bottled water in your emergency kit or vehicle. Never eat snow. It will chill you and lower your body temperature. Remain calm. Chances for rescue are better if you remain calm and in your vehicle.